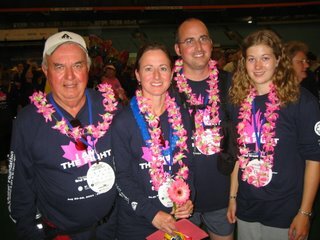 The picture above is from 2 yrs ago, the Vancouver "Weekend to End Breast Cancer" 60 km walk, and is (from the left) my dad, my sister, my brother and Michelle (daughter).... This past weekend was the first "walk" in Winnipeg. Michelle volunteered as "crew" for the event, and she struggles a bit with the emotional part of it, but I am very proud of her. I happened to drive past part of the walk route this year and it is very overwhelming and emotional in a way I can't explain. Seeing the walkers as they made their way to camp, tired but smiling.......It is very remarkable that so many people would go to so much effort, both in walking and in donating and even the organizing...... all to benefit people like me..... My sister, my 12 yr old niece, my brother and his wife (My SIL) will be doing the walk again this year in Vancouver (you can look them up as "Joanne's Team", and several friends whose lives have been profoundly touched by breast cancer are also walking in Calgary, Edmonton, Toronto. My Grandma Maloney used to say "What cannot be cured must be endured" (I think most of my aunts and uncles still say it) and that is pretty much what these big chemo weeks are like.... the good thing that with every passing hour, I'm closer to getting through the worst of it. Hey, thanks to my blog responders, I feel very famous, but please don't anyone feel obligated! Great to see your new blog, Joanne! So glad antinaus drugs are workin' foi ya. Nothin' worse than feelin' like your life comprises starin' at the bottom of a bucket mostly, so it's good news to hear that it's mostly under control. P.S. LOVED the Washington quote farther down. That's one of the many things I love about you......your tenacity in the face of adversity. You my hero! This was a great idea. It's nice to hear how it is all going. Also great to see everyone's pictures. I'm new to blogging too so I may have to learn to keep it short. Just thought I'd let you know that I'm out here. Sounds like you're doing a great job "enduring" Grandma would be proud. Hi Joanne, glad everything is working with the blog. When is the walk in Vancouver?